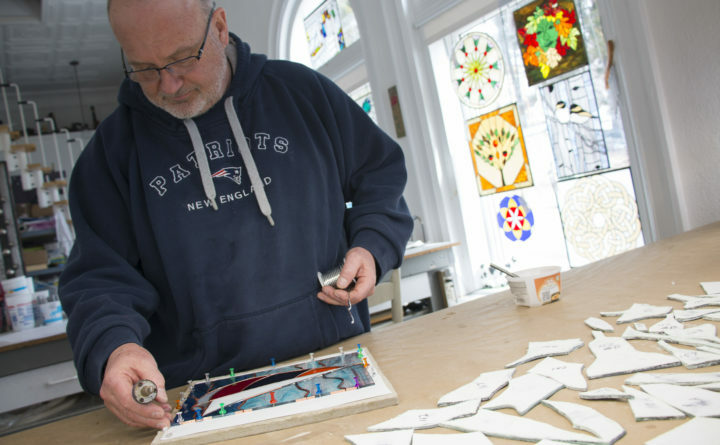 Dave Roy, co-owner of Stubborn Cow Glass, works on a small glass panel of a sailboay on March 29, at Stubborn Cow Glass studio in Bucksport. 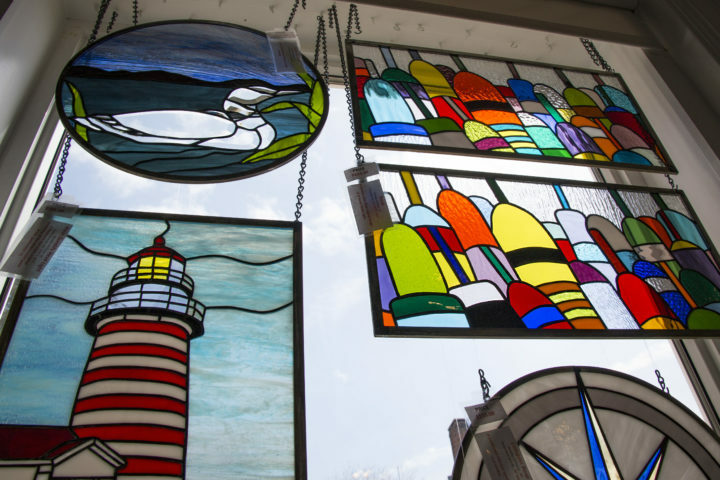 Loons, lighthouses and buoys are among the most popular subjects for small stained glass panels at Stubborn Cow Glass in Bucksport. 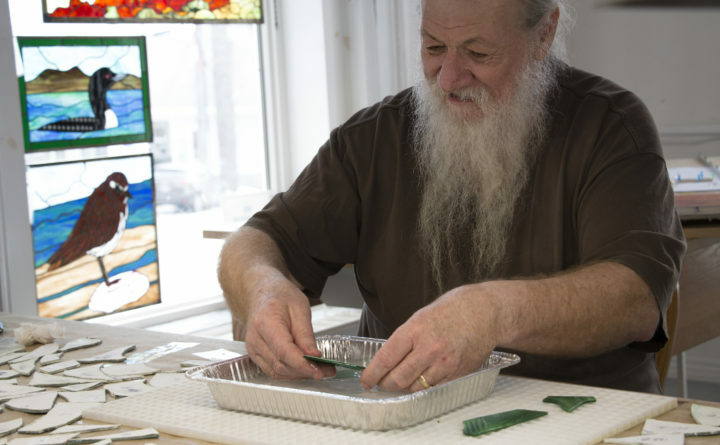 Dave Roy, co-owner of Stubborn Cow Glass, works on a small glass panel of a sailboat on March 29, at Stubborn Cow Glass studio in Bucksport. Joe Comeau of Lagrange works on a large stained glass panel on March 29, at Stubborn Cow Glass in Bucksport. Hummingbird and chickadee sun catchers are top sellers at Stubborn Cow Glass in Bucksport, where they are handcrafted by owners Dave and Lisa Roy. Stubborn Cow Glass co-owner Dave Roy and his "stained glass friend" Joe Comeau of LaGrange work on stained glass panels on March 29, at the Stubborn Cow Glass studio in Bucksport. 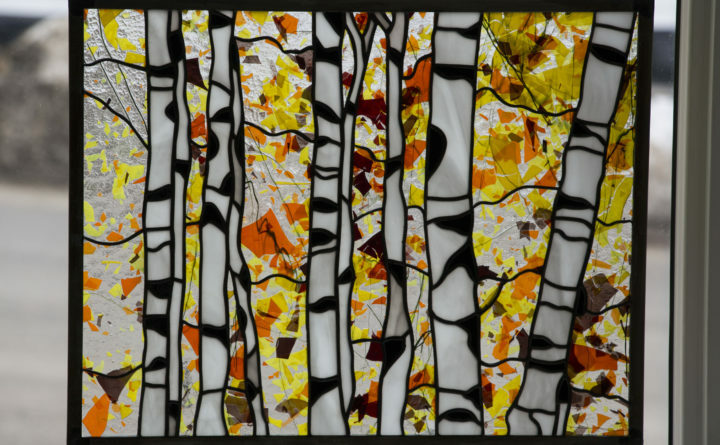 A stained glass panel of birch trees is one of the top sellers at Stubborn Cow Glass, a studio owned and operated by Dave and Lisa Roy in Bucksport. A glass panel hangs in one of the front windows of Stubborn Cow Glass stained glass studio at 55 Main St. in Bucksport. Late morning sunlight streamed through the windows of the old brick building, illuminating hundreds of stained glass creations. Hummingbirds with ruby throats and emerald wings glowed beside cardinals and chickadees, orchids and grape vines. In another window, a peacock stood in full glory, its feathers crafted out of hundreds of glass pieces, hand cut and soldered together with thin veins of metal. 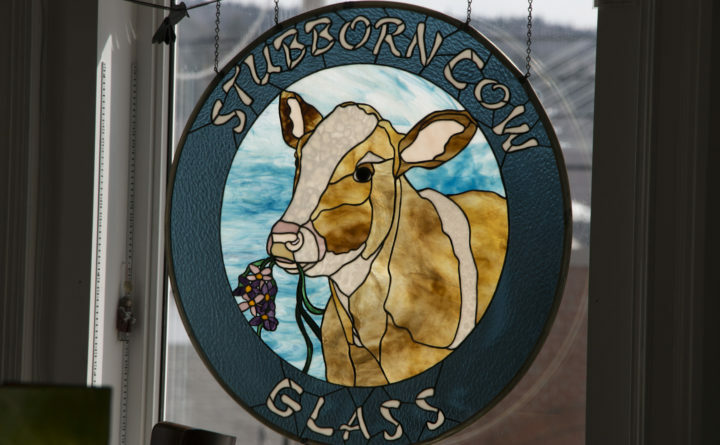 Stubborn Cow Glass, a stained glass studio in Bucksport, is a beautiful place, especially on a sunny day. 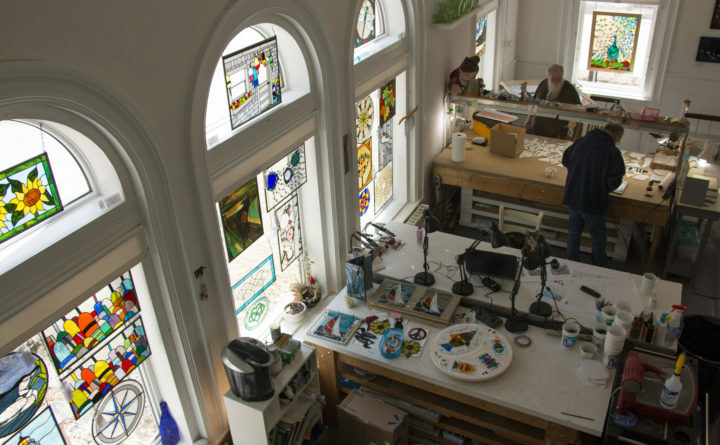 Housed in an old bank building on Main Street, the studio is a shop, classroom and the home of Dave and Lisa Roy, who share their love of stained glass with anyone who walks through the door. 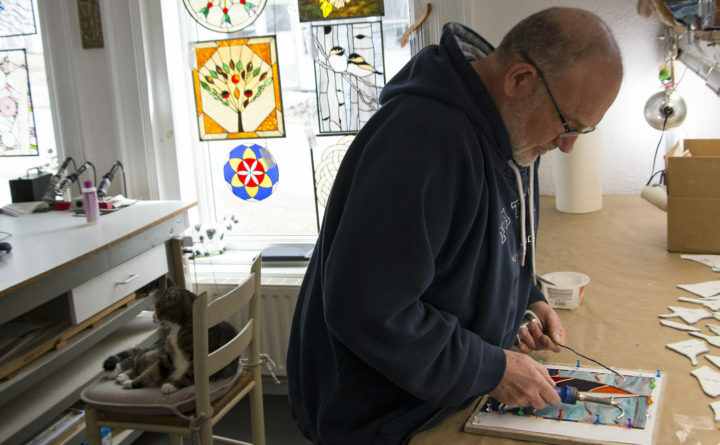 That’s why the couple initially got into stained glass work nearly 20 years ago: to take their minds off the day-to-day. Both IT professionals, the Roys took a few classes on stained glass as a way to de-stress, unwind and spend time together. How stained glass creations, such as a glass panel, are made can vary, but often it includes mapping out the pattern with paper, then tracing those shapes with a marker onto stained glass sheets. A shallow line is then created along the marker lines with a scoring tool, then the glass is broken by grasping it in two hands (or pliers) and using a motion that is similar to breaking apart pieces of a chocolate bar. So they fit together perfectly, glass shapes are often perfected with a grinder. Then the edges of the glass are wrapped in copper foil, which has an adhesive side that sticks to the glass. 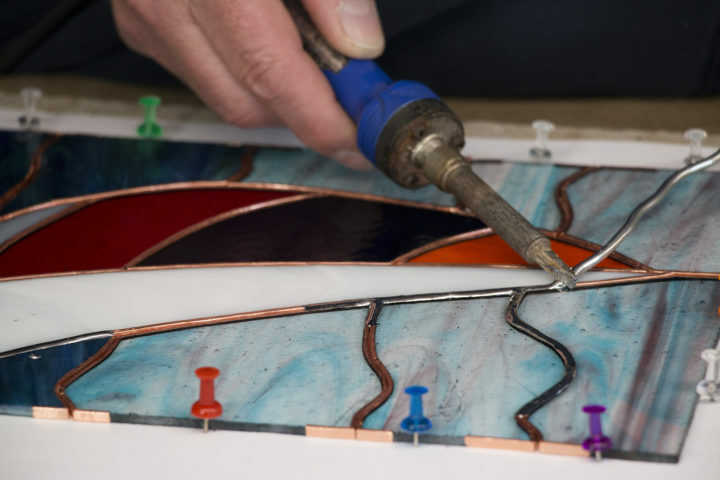 This is done because solder — a fusible metal alloy used to assemble stained glass pieces — will not stick to glass, but it will stick to the foil. 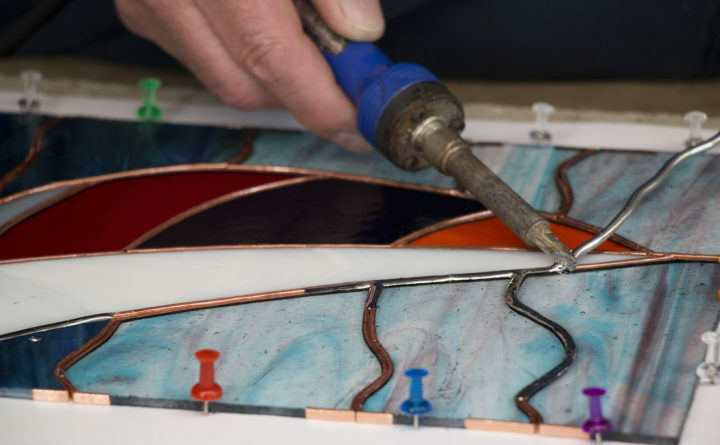 The glass pieces are then assembled, and a soldering iron is used to melt the solder onto the copper edges of the pieces, joining them together. As a finishing tour, a patina product is often applied to darken the color of the solder and copper foil. It wasn’t long before their hobby had evolved into a passion. As their experience in the craft grew, so did their supplies and need for a bigger space. 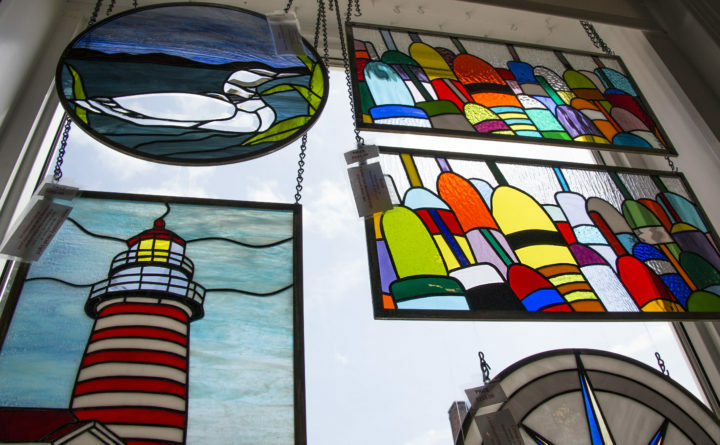 Open since 2012, Stubborn Cow Glass isn’t just their studio, it’s a shop filled with their creations, from giant glass panels created to be hung in windows to intricate Tiffany-style lamps and fused glass jewelry bowls and platters. It’s also a place for stained-glass artists to stock up on glass priced by the square foot, as well as copper foil, lead rods and other soldering supplies. And perhaps most importantly, it’s a place for people to learn about the craft and try it out for themselves. Working together, the couple offers a variety of classes, from a $45 beginner stained glass class in which the students make suncatchers to $90 intermediate classes for constructing larger pieces called panels. Both of these classes are scheduled at least twice a month, and other types of classes, such as instruction on lamp building and mosaics, are available on request. “It’s so much fun to meet people and to work with them on these projects,” Lisa Roy said. Her partner echoed her sentiment. While the couple often works on big pieces, such as lamps, together, they also have their own styles and projects. Dave Roy tends to design pieces that are more geometric and structured, often showing off special types of glass in big pieces, while Lisa Roy delights in nature, often arranging the glass into images of birds, flowers and outdoor scenes. 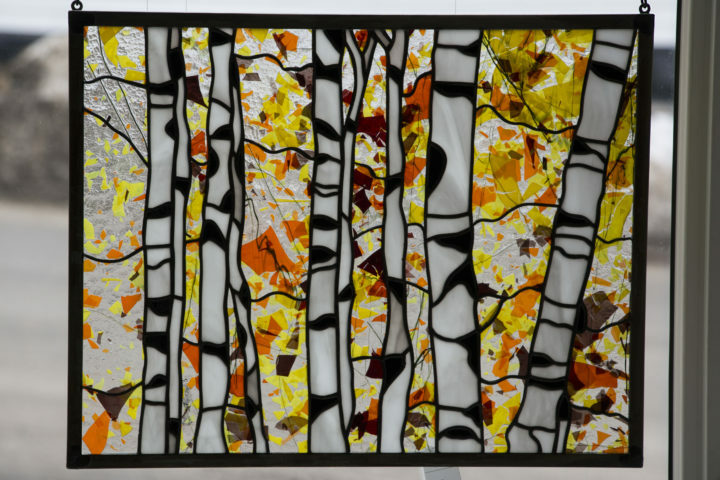 Her work tends to be more detailed, with some of her panels made out of hundreds of pieces of glass. The funny thing is, the Roys don’t consider themselves to be necessarily artistic. The pieces the Roys make are 99 percent their own designs, created on special computer software for mapping out mosaics. And they occasionally craft reproduction pieces of famous Tiffany creations and iconic paintings. The studio takes up the entire main floor of the stately brick building, with the old bank vault serving as a supply closet. Giant windows march down both sides of the building, making it the ideal space to display their glass creations. And covering the floorspace are big work tables and cubbies filled with sheets of glass of different colors, patterns and even textures. The Roys live downstairs, but they’re never truly separated from their craft. Often they’ll wrap copper foil around the edges of glass pieces, preparing them to be soldered, while they watch TV or visit with friends. “During football season, I have to be foiling or I feel guilty [watching the games],” Dave Roy said, coincidentally while wearing a New England Patriots sweatshirt. 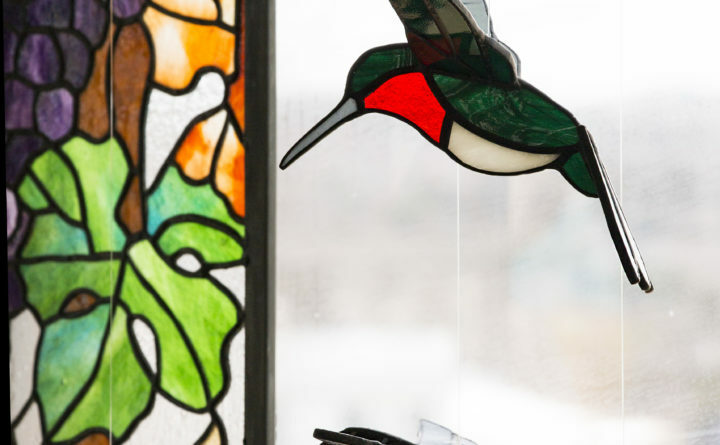 This spring, as the sun illuminates the Roys’ creations just a bit longer each day, the couple will prepare for tourist season by creating some of their most popular suncatchers and panels of sailboats, lighthouses, buoys and loons. Each year, they come up with new designs, then test them out on Maine’s many summer visitors. 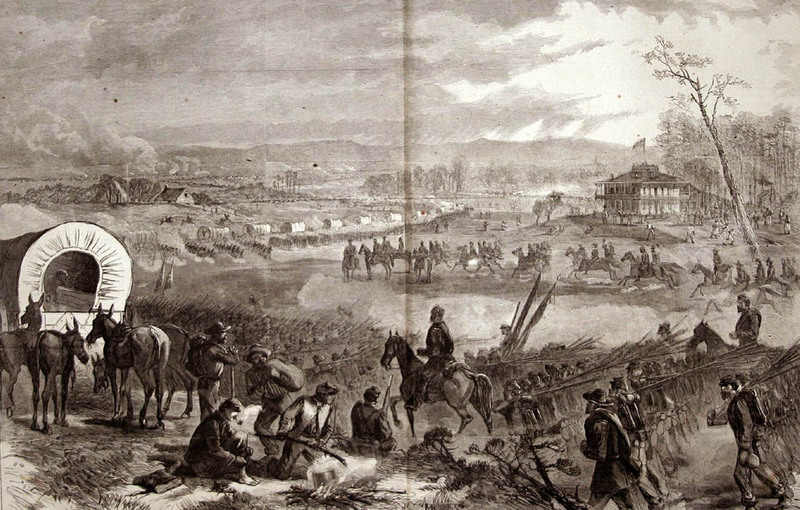 Some tourists return to purchase a new piece each year, and the Roys believe their work is always improving. To see a schedule of their classes and view photos of their many stained glass panels, lamps and lanterns, visit stubborncowglass.com. The website also includes a student gallery, displaying the many glass panels they helped people produce over the years by sharing their skills and knowledge.